The EXPLORER 510 is the smallest EXPLORER BGAN terminal ever and is the perfect choice when you are working off the beaten track and dependent on a reliable connection. The EXPLORER 510 meets the need for mobile access to office resources, providing simultaneous high-quality voice and broadband access at speeds up to 464kbps. If you want to use your smartphone with the EXPLORER 510, install the EXPLORER Connect app, which is available for iOS at the Apple Store and for Android phones at Google Play. 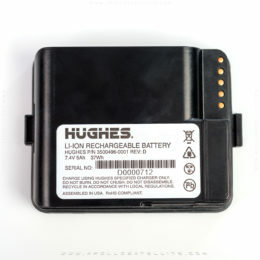 The EXPLORER 510 has an internal battery, which is recharged when external DC power is connected to the DC input. NOTE: If you hear a sound from the EXPLORER 510 at this point, it is in pointing mode. See Point the antenna (BGAN) below. To switch off, hold the power button for 2 seconds until the Status LED flashes rapidly yellow (closing down). NOTE: You may have to enter a password. By default the password is the serial number of your EXPLORER 510 and the encoding type os QPA2-AES. The serial number is found on the label on the back on the EXPLORER 510. Your device is now connected to the EXPLORER 510. When the EXPLORER 510 is registered on the BGAN or cellular network, the connection to the Internet is established automatically. Calls: If you want to use WLAN to make calls over the BGAN network, you must have the EXPLORER Connect app or another SIP client installed on your smartphone. See Connect a phone to WLAN for making calls on page 8. The EXPLORER 510 is a BGAN terminal by default. However, if you are within coverage of a cellular network, you may want to acquire an EXPLORER Cellular Modem and use that as an alternative to the BGAN network. Note that you need a separate SIM card for the cellular network, the EXPLORER 510 SIM card can only be used for the BGAN network. NOTE: The EXPLORER 510 does not provide automatic switch-over between BGAN and cellular network, so you have to select the network you want to use. You can now access the Internet through the cellular network from a device connected to the EXPLORER 510. Note that you cannot make calls over this connection, and you cannot use the BGAN network as long as Cellular modem is selected. 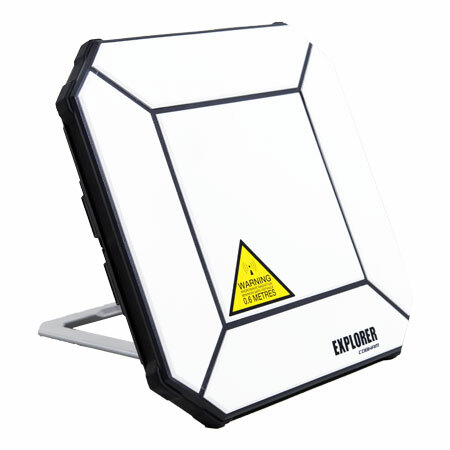 To obtain optimum bandwidth and operating time, adjust the position of the EXPLORER 510 to maximum signal strength. Find the approximate direction of the satellite. See Satellite coverage at the end of this guide for a map with the location of the satellites. Use the pointing sound to find the highest possible signal strength, while slowly rotating and tilting the EXPLORER 510 in the direction of the satellite. If you need to see signal strength, you can connect your smartphone, start the EXPLORER Connect app and select Pointing to follow the pointing process on screen. Push the power button briefly or select OK in the EXPLORER Connect app to accept when you have obtained the highest possible signal strength. The EXPLORER 510 now starts to establish a connection to the BGAN network. NOTE: You must start your data connection manually before you can use it. See Connect to the Internet in the following sections of this guide. When you are not using your data connection, stop the connection or disconnect your device to avoid being charged for any unwanted transmission. To restart the pointing process, select Pointing from your EXPLORER Connect app. This step is only needed if the SIM card for your EXPLORER 510 or your cellular modem required a PIN and you want to communicate on the BGAN or cellular network. Connect your smartphone to the EXPLORER 510. See Connect to WLAN on earlier in this guide. Start the EXPLORER Connect app on your smartphone and select Terminal Access. If a PIN is required, you are now prompted for the PIN. Type in the PIN and click OK. If you do not enter a PIN code now, you can enter it later from the alarm list. Click the Exclamation Point at the top of the page to access the list. Connect a PC, tablet, or smartphone to the EXPLORER 510, e.g. with WLAN. Enter the local IP address of the EXPLORER 510 (default 192.168.0.1) in the address bar. The web interface now opens in your browser. For information on how to use the web interface, click the ? on the screen to access the user manual. NOTE: To change the language of the web interface, click the gears, select Terminal settings, and then select your language from the Language list. By default, you must manually start data connections from the EXPLORER Connect app or the web interface. 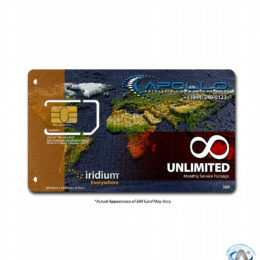 With a Standard data connection you can browse the Internet, send e-mail etc. With a Streaming connection you get an exclusive, high-priority connection for time critical applications such as live video over IP. From the EXPLORER Connect app select Terminal Access (or start the web interface). NOTE: Once a Streaming connection is started, the connection will run until you stop it. You will be charged for the time you are connected. NOTE: Under Terminal Access or in the web interface you can configure your selectable data connections and whether or not you want automatic activation of your data connection. Your smartphone can be set up to make and receive calls over the BGAN network, using the phone number of the EXPLORER 510. If you have the EXPLORER Connect app on your smartphone, no initial setup is necessary and you can connect as described in the next section. Start up the EXPLORER 510. Connect your smartphone to the wireless access point of the EXPLORER 510. See Connect to WLAN earlier in this guide. Start the EXPLORER Connect app and select Satellite Phone (or start another SIP application). NOTE: The first time you use the EXPLORER Connect app with your EXPLORER 510 you must select Register to register the phone with the EXPLORER 510. You should now be ready to make and receive calls over BGAN. If you do not have the EXPLORER Connect app, you must first set up your phone as described in the next section. If you have the EXPLORER Connect App you can skip this section. NOTE: Make sure your phone has an integrated SIP client. If you do not have a SIP client, you can find SIP applications available for download on the Internet. The username and password must match the IP handset settings in the EXPLORER 510. You can configure these settings in the web interface by selecting the gears and then IP handsets. Note: There are two audio qualities: Standard voice and Premium voice. By default, the Standard voice quality is used. To force the call to use Standard voice, dial 1* before the number. To force the call to use Premium voice, dial 2* before the number. (+ is the prefix to call out of the country you are located in). NOTE: There are two voice numbers, one for Premium voice and one for Standard voice. WLAN settings are restored to default. The WLAN LED lights yellow. The EXPLORER 510 restores factory settings and reboots the system. All changes to the configuration are lost. Loosen the two screws holding the SIM cover. 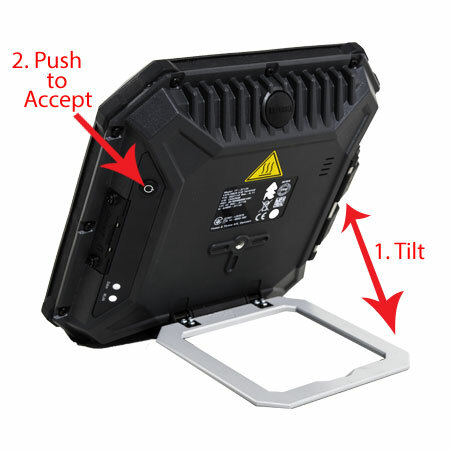 Close the cover and tighten the two screws carefully – this is important in order to maintain the IP grade of the EXPLORER 510. NOTE: The charging temperature range in Japan is 10° to 45° due to legal requirements. The charging temperature in all other countries is 0 to 45°C. WLAN: The EXPLORER 510 is designed to connect to user equipment primarily through WLAN (see Connect to WLAN earlier in this guide). Before pointing the antenna you can use the coverage map below to find your approximate location in relation to the satellites. The Inmarsat satellites are positioned above the equator, at the center of each “footprint”. For all other issues please refer to earlier in the Explorer 510 Quick Start Guide. Any responsibility or liability for loss or damage in connection with the use of this product (or the Explorer 510 Quick Start Guide) and the accompanying documentation is disclaimed by Thrane & Thrane A/S. The information in the Explorer 510 Quick Start Guide is provided for information purposes only, is subject to change without notice, and may contain errors or inaccuracies. Manuals issued by Thrane & Thrane A/S are periodically revised and updated. Thrane & Thrane A/S is not responsible for the content or accuracy of any translations or reproductions, in whole or in part, of this manual from any other source. In the event of any discrepancies, the English version shall be the governing text. Thrane & Thrane A/S is trading as Cobham SatCom.